^ Bonanno, A.; Schlattl, H.; Paternò, L. (2008). 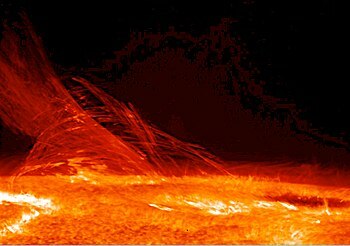 "The age of the Sun and the relativistic corrections in the EOS". Astronomy and Astrophysics. 390 (3): 1115–1118. arXiv:astro-ph/0204331  . Bibcode:2002A&A...390.1115B. doi:10.1051/0004-6361:20020749. ^ Basu, S.; Antia, H. M. (2008). 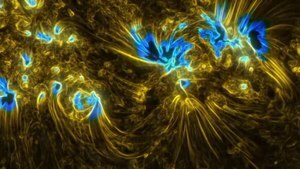 "Helioseismology and Solar Abundances". Physics Reports. 457 (5–6): 217. arXiv:0711.4590  . Bibcode:2008PhR...457..217B. doi:10.1016/j.physrep.2007.12.002. ^ Lada, C. J. (2006). "Stellar multiplicity and the initial mass function: Most stars are single". Astrophysical Journal Letters. 640 (1): L63–L66. arXiv:astro-ph/0601375  . Bibcode:2006ApJ...640L..63L. doi:10.1086/503158. ^ Kogut, A.; et al. (1993). 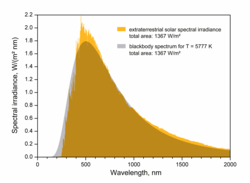 "Dipole Anisotropy in the COBE Differential Microwave Radiometers First-Year Sky Maps". Astrophysical Journal. 419: 1. arXiv:astro-ph/9312056  . Bibcode:1993ApJ...419....1K. doi:10.1086/173453. ^ Basu; et al. (2009). 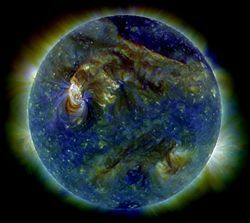 "Fresh insights on the structure of the solar core". The Astrophysical Journal. 699 (699): 1403. arXiv:0905.0651  . Bibcode:2009ApJ...699.1403B. doi:10.1088/0004-637X/699/2/1403. ^ Broggini, Carlo (26–28 June 2003). "Nuclear Processes at Solar Energy". Physics in Collision: 21. arXiv:astro-ph/0308537  . Bibcode:2003phco.conf...21B. ^ Haubold, H.J. ; Mathai, A.M. (May 18, 1994). "Solar Nuclear Energy Generation & The Chlorine Solar Neutrino Experiment". Basic space science. AIP Conference Proceedings. 320: 102. arXiv:astro-ph/9405040  . Bibcode:1995AIPC..320..102H. doi:10.1063/1.47009. ^ Schlattl, H. (2001). "Three-flavor oscillation solutions for the solar neutrino problem". Physical Review D. 64 (1): 013009. arXiv:hep-ph/0102063  . Bibcode:2001PhRvD..64a3009S. doi:10.1103/PhysRevD.64.013009. Halaman ini terakhir diubah pada 18 April 2019, pukul 14.33.